World Leaders Discussion - “Making Global Goals Local Business"
JAIPUR: Over 30 thought leaders from across the world gathered at the Delhi showroom of Jaipur Rugs to discuss ways of innovating stakeholder co-creation and to learn the best practices being followed by businesses across the globe, for achieving sustainable development goals. The program was organized under the UN Global Compact's 'Making Global Goals Local Business' and was held on April 26, 2017. Jaipur Rugs offers a range of home décor products and works towards uplifting the rural community of weavers by working directly with local artisans. 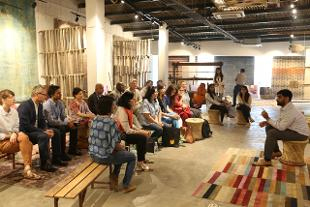 The leaders exchanged their queries on how Jaipur Rugs is working towards the survival of a dying art- the art of hand-weaving rugs and how sustainable livelihood opportunities for local communities are being created by the organization. The organization's model of connecting rural artisans who have successfully adopted the doorstep entrepreneurship model to connect with global consumers was discussed at length. The program was held to enable the global delegation to understand the regional sustainable development goals to help in their aim of advancing its progress in India. The program offered the local entrepreneurs a global stage to present their journey of empowerment and interact with the thought leaders. Shanti Devi, Bunkar Sakhi (Weaver's friend) shared her story on how her journey of being a coach of weavers in her village. She also presented various aspects of rug weaving and quality assurance followed during the process of run looming. Another presenter, a designer with Jaipur Rugs, Laxmi talked about the transformation the organization has brought in her life, "When I joined Jaipur Rugs, I was under-appreciated and totally neglected even by my own family members. But I have found a loving set of family members in this organization and I cannot thank Bhai Saab (Nand Kishore Chaudhary, CMD, Jaipur Rugs) for changing my life."